THE WRITING BUDDHA - Opinions | Books | Movies: All Yours, Stranger by Novoneel Chakraborty (Book Review- 3.75*/5) !!! 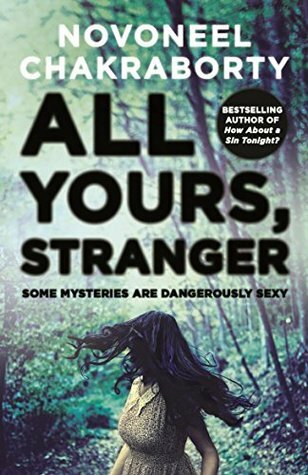 All Yours, Stranger by Novoneel Chakraborty (Book Review- 3.75*/5) !!! After finishing the Book 1 in The Stranger Trilogy last midnight, I returned back from office early to finish the Book 2 which is of 242 pages. Thankfully, with no disturbance even though Virat Kohli scored yet another half-century for RCB, I managed to concentrate upon this book. Haha! Compared to first book, this book starts slowly and you just keep on wishing when the stranger will come back in life of Rivanah again. But he/she (of whatever gender the stranger is) didn't take entry in the first half and whatever little bit he took in the second half wasn't enough to give you the same goosebumps as Book 1. Book 2 is more about the protagonist yearning for the stranger to come back in her life as she is facing an emotional turmoil to find her boyfriend giving his best friend, Tania, more attention than her. She knows that anyone who could help her is one and only stranger. Finally after a very long time he comes back in her life to help her but starts keeping difficult clauses like the Book 1 and kept reminding the protagonist to understand what her worth is. The Book 1 ends where it seemed as if the Book 2 will reveal the story behind Hiya Chowdhury but unfortunately, that is still a mystery for the reader. The book is still a page-turner because you want to know who the stranger is and why is he behind Rivanah but frankly speaking, this book should have been better than the Book 1 to make the reader go crazy about it which it isn't. There are many elements which are still magical about how the protagonist meets her ex-boyfriend through a new roommate and the way things starts happening with her life which she is unable to comprehend though she knows stranger is doing it for her. The last few pages are again written with wonderful narration where you read it in a speed that even you would not have discovered you had. You want to know who the next suspect is but the last page is totally unexpected and it is going to be great reading the Book 3 with all these secrets opening up one after another. I have liked how author didn't make a joke of this character "Stranger" that he has developed in the Book 2 and managed to create the same kind of curiosity about him in the reader's mind. Coming to the drawback, I felt that the first half is totally wasted in dilemma that the protagonist is going through watching her boyfriend getting more concerned about some other girl. The book just didn't look like a thriller all this while but like some yet-another-cheesy-novel. Otherwise the 2nd half is what I expected this book to be. I would go with 3.75*. Honesty works better than Skills And Talent!!! Is your MOTHER the only SPECIAL one? Gumrah by Ira Trivedi (Book Review-3*/5) !! !